November 9, 2010 By John P.
Joshua Allen Harris did some amazing street art in New York back in 2008, and I’ve been wondering where he has been since then. I can’t find him on Twitter, Facebook, or even a Web page for him. So if anyone out there knows where to find the real Joshua Allen Harris please leave a comment below! In the meantime, take a gander at his unique and beautiful designs. 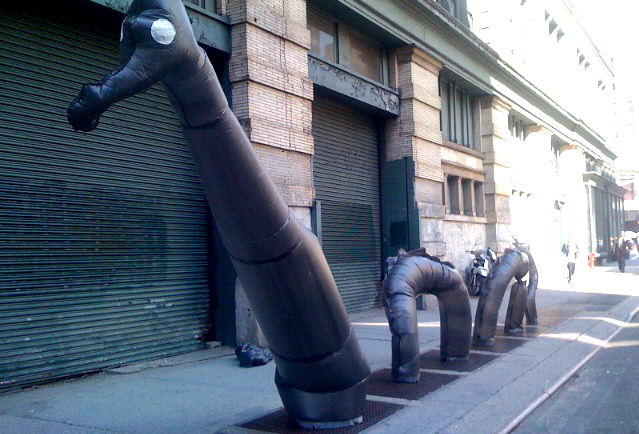 He creates mythical creatures out of bags and then uses the hot air rising from steam grates in New York City to inflate them. Simply amazing! Not neat but awesome, I wonder where has he dissappeared.